The three-dimensional shape of molecules is crucial to their function within the body. Changes to the shape, or structure, of molecules can contribute to the development of diseases including cancer and autoimmune disorders. Our research revealing the structures of biological molecules is leading to new ways to treat disease. Revealing the three-dimensional structures of proteins and how these relate to their functions in cells. Exploring how certain proteins interact in health and disease. Discovering new treatments for diseases based on the three-dimensional structures of critical proteins. Every molecule in our bodies has a three-dimensional shape, its structure. Structural biology aims to determine the unique shapes of these molecules. Proteins are relatively large molecules that have an intricate and unique structure. The structure of a protein allows it to fit, or interact, precisely with other molecules, like pieces in a jigsaw puzzle. Changes in the structure of particular proteins have been linked with many diseases. One cause of these changes to a protein’s structure is alterations (mutations) to the gene that carries the instructions to make that protein. If genetic mutations occur, the resulting protein structure will be affected. This can alter its ability to interact with other molecules. This affects how the protein functions within the cell, potentially altering the cell’s behaviour. Thus, changes in protein structure can underlie disease. X-ray crystallography, which uses x-rays to determine the structures of proteins. To achieve this, the proteins must be in a crystallised form. When the x-ray beam hits a crystallised protein (or some other crystallised molecule), the x-rays are scattered in discrete directions producing a diffraction pattern from which researchers are usually able to deduce the structure of the protein. Synchrotrons are large devices that generate intense x-ray beams, improving the detail of protein structure that can be determined. Our structural biology researchers use the Australian Synchrotron in Melbourne in their research. Nuclear magnetic resonance (NMR) spectroscopy uses strong magnetic fields to determine the location of atoms within a protein molecule. As well as revealing the protein's structure, researchers can detect how the protein structure can move under certain conditions. Electron microscopy is emerging as a powerful method for studying the structures of very large molecules even when they cannot be coaxed into a crystalline form. 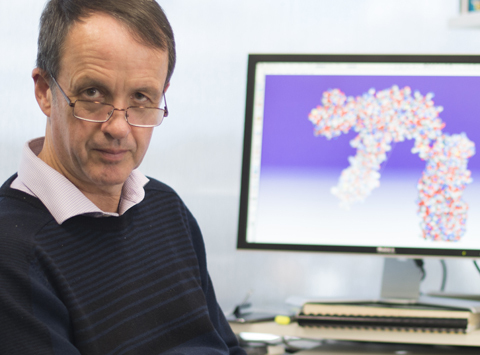 To take advantage of these developments, our researchers have partnered with Monash University in establishing the Clive and Vera Ramaciotti Centre for Structural Cryo-Electron Microscopy. Uncovering the structure of proteins and how this relates to their function is leading to new treatments for many diseases. Our researchers are revealing the structure of proteins that are important in disease, and understanding how each structure relates to the protein’s function within cells. Our medicinal chemistry researchers can then design small molecules that can bind to crucial parts of the protein’s structure. This can influence the protein’s function, potentially stifling its contribution to disease. In the long term, some of these small molecules can undergo clinical trials to evaluate their potential as new medications.